This one remarkable and all natural product hold the answer to a vast range of oil related pollution problems. It works fast and effectively with the heaviest of crude and unrefined oil issues and it serves to fully remediate the affected environment ©. The numerous Oil Refineries, oil treatment and processing plants and oil wells of the World all have one thing in common. An ability to create sometimes unexpected pollution in places that always seems to have a huge environmental impact. 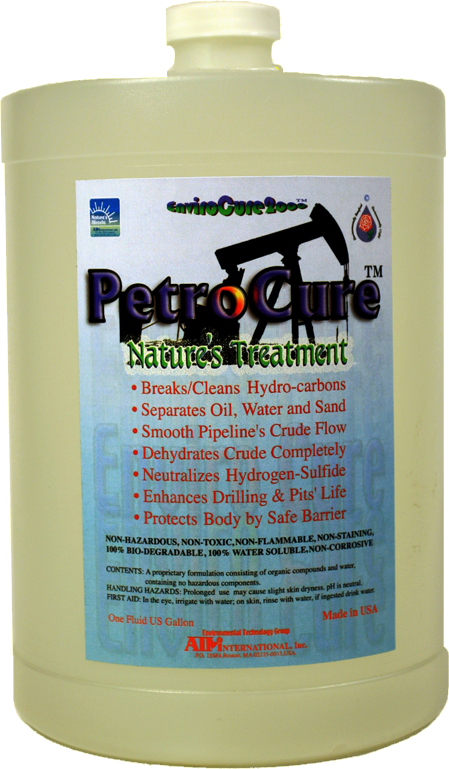 Petro-Cure TM offers an immediate and all natural solution to a vast range of highly expensive oil related issues that are faced by these large companies almost every day. The proof of this product is readily available to be seen ... all they need do is simply ask us. It can remediate even an oil filled tailing pond within a short period of time. Protecting our land, waterways, nature and other environmentally sensitive areas with nature treatment. PetroCure™ is a derivative of nature's ultimate miracle, EnviroCure2000™, which is made from edible plant-base, and natural mineral salts. PetroCure™ is industrially useful in degreasing and lifting heavy oils by emulsifying, encapsulating and breaking down hydrocarbons. PetroCure™ is effectively helpful in oil refineries, petrochemical industries, in cleaning tanks and vessels, settling tanks and ponds, substantial lowering of crude oil's density heaviness (API), in pipeline friction reduction for smooth crude and oil flow while simultaneously separating water totally, as well as in revitalizing dried-up and low-yield oil wells, whereby yield is increased by up to 10 times. 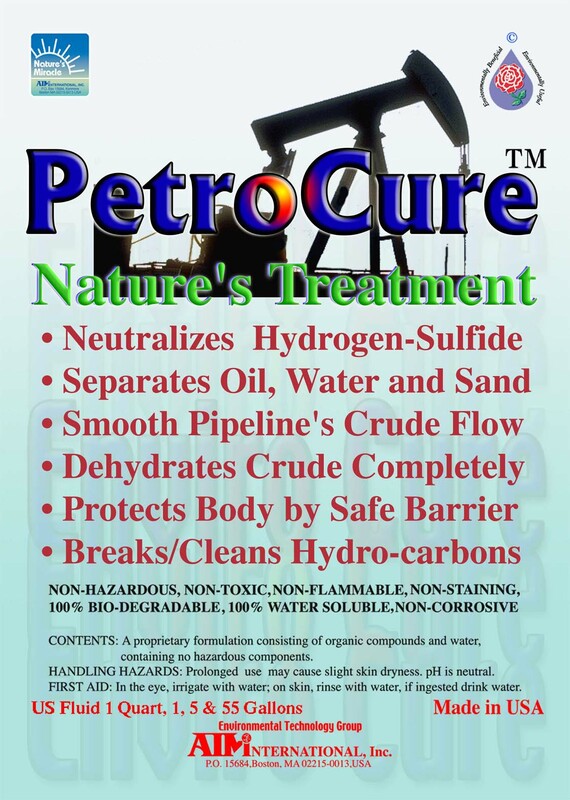 Additionally, PetroCure™ is extremely effective in trapping hydrogen sulfide and in neutralizing powerful acids. By using PetroCure™, more oil is recouped, less waste and toxic gases are introduced into the environment, and less time, money and efforts are spent on environmental hazardous clean-ups. "I have spent most of my professional life in oil refineries, dry docks and cleaning of oil tankers and storage tanks," Says Eng. Tariq of Bahrain, "This PetroCure is like nothing I have seen in my life. It opens clogged pipelines, cleans storage tanks, prevents crack fires and decontaminates from oil spills. It will revolutionize the oil industry and save millions of dollars." Pipelines clogging, "cracker explosions", cleaning of tankers and storage tanks, as well as decontamination from oil spills is now easier to solve than ever before. By using this plants-based technology, time, money, and most importantly - the environment will be spared. From the vast oil fields of the Middle East, throughout our mighty oceans where oil filled tankers travel daily, to the oil sands of Canada and everywhere in the World that oil is being refined, delivered through pipelines, stored in huge tanks or just used in general ... here we have a proven all natural and highly effective solution to an enormous range of issues and potential pollution hazards. Total risk mitigation for the Oil Industry ... made by Mother Nature in partnership with Science.